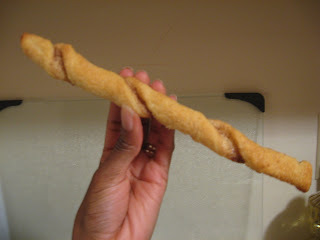 This yummy recipe is super simple….i mean, how much easier can you get with crescent rolls, cinnamon and sugar? In a small bowl, put sugar, cinnamon and nutmeg. Stir until fully combined. Unroll crescent roll dough, lay dough on a lightly floured surface, and separate into 2 rectangles. Pinch closed the perforated lines and gently press or roll the dough of each rectangle. Lightly butter each rectangle. You just want to give the sugar something to help it caramelize and stick to the dough. Liberally sprinkle the sugar mixture on top of the dough. Using a knife or pizza cutter, cut each rectangles lenghtwise into 4 sections, making 8 sections all-together. Bake for 8 to 10 minutes (check after 8 minutes) or until golden brown. Allow to cool for 20 minutes or until stiff. These are great with a cup of hot cocoa or with a small bowl of ice cream. I decided to serve these with my beef enchilada bake because cinnamon and sugar are classic ingredients in mexican desserts (churros anyone?). EDIT: Its been a day since I made them and we only have a few left. They are now nice and crispy, like a sweet breadstick. I stuck them all in a beer mug and put them on the counter last night. Hubby got to them so now there are only 2(there were 3….sonny boy ate one for dessert tonight). *sigh* I can’t have anymore kids…..if I do, all the food will be gone before I even get to the table!